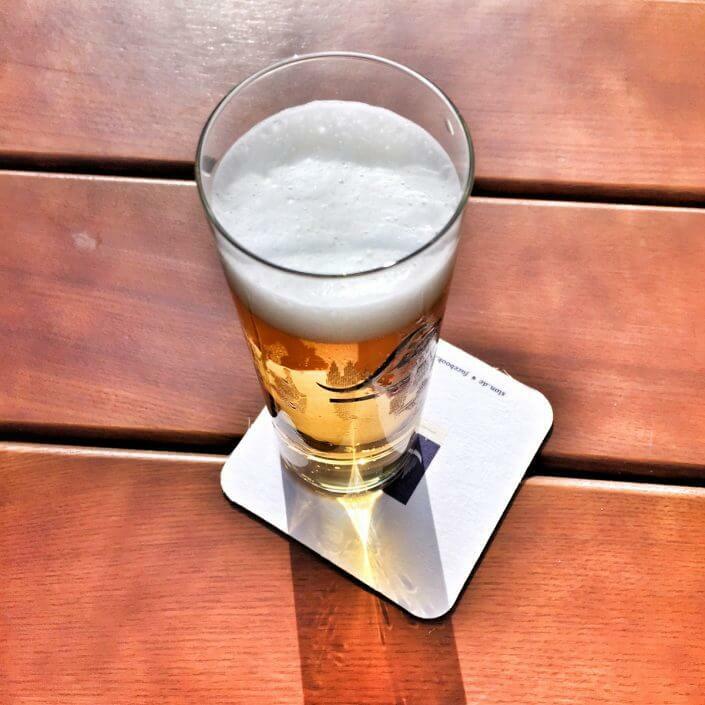 At Brauhaus Sion you’ll find tourists, lunching locals and snacking suits enjoying the view of the City Hall tower during their break. The waiters bustle to and fro, chatting to the guests about the nice weather. Menus with blue, faux leather covers adorn the tables, next to pepper pots and salt shakers. It’s a scene that probably hasn’t changed for ten, twenty, even thirty years. The Kölsch is fast-flowing and, according to the inscription on the outside wall, they’ve been brewing it here since 1318 (when it was still infused with herbs and honey). 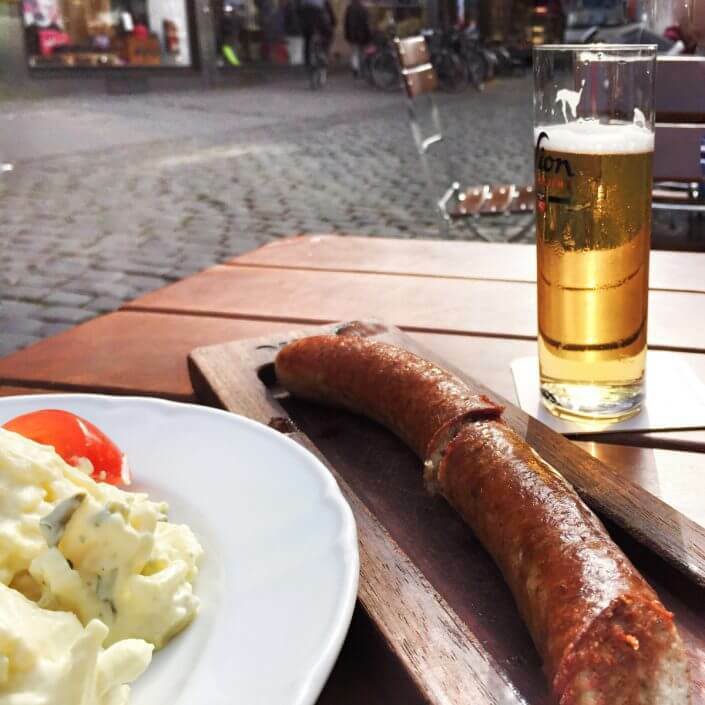 Equally traditional is the “Sudpfannenputzer” – a fresh Bratwurst, half a metre long, served on a wooden platter alongside the local take on potato salad – with an optional side of savoy cabbage when temperatures drop outside. It’s a modest meal but sometimes modest is all you want. 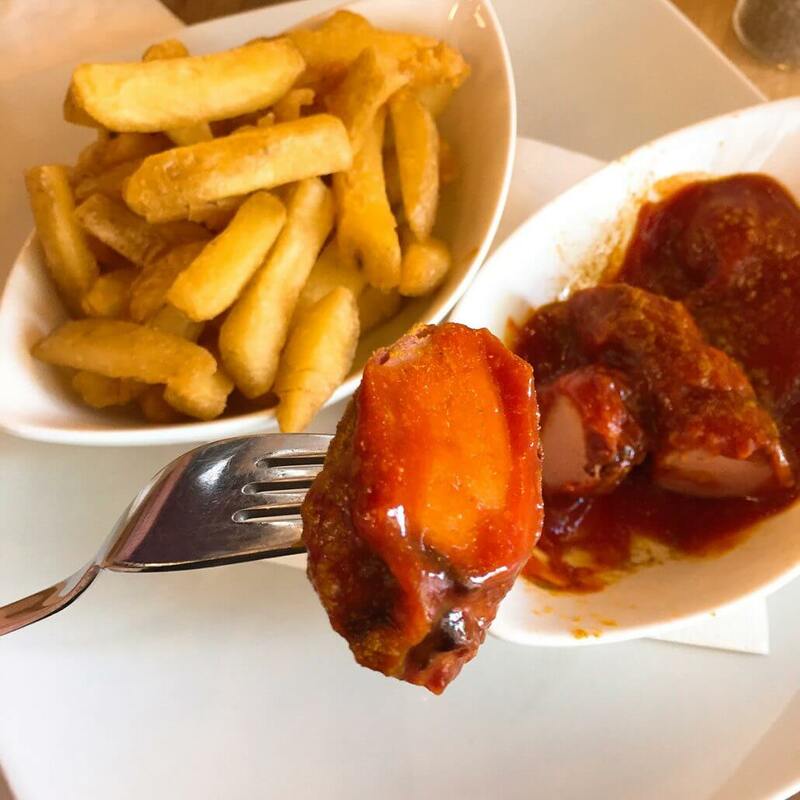 At the epicentre of student life in Cologne, towards the end of what’s known as the “Zülpicher Meile”, culinary highlights didn’t really use to feature heavily on the menu. In fact, you might say it was more a case of “happy hour beats haute cuisine”. But then came the street-food hype and suddenly everyone was interested in good food. I sip on a beer on a battered bench on the pavement. Hip hop beats waft through the open windows onto the street, and even the menu, with its “Classic Philly Style Sloppy Dog” and “Coney Island Funhouse Corn Dog”, sounds a bit like a selection of trendy old-school acts to the uninitiated. 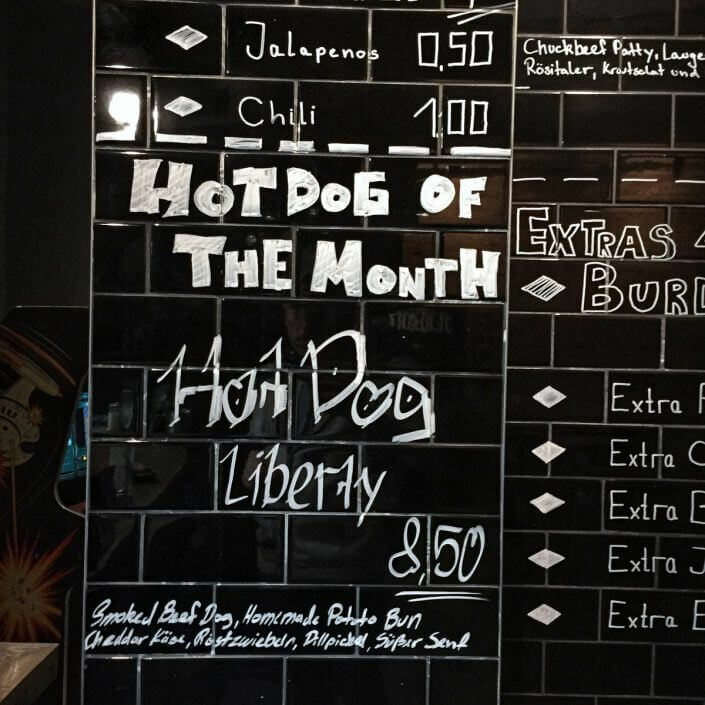 Ordering this month’s sausage special – Hot Dog Liberty with smoked beef dog, homemade potato bun, Cheddar, fried onions, dill pickle and sweet mustard – I feel a little Brooklyn style myself. 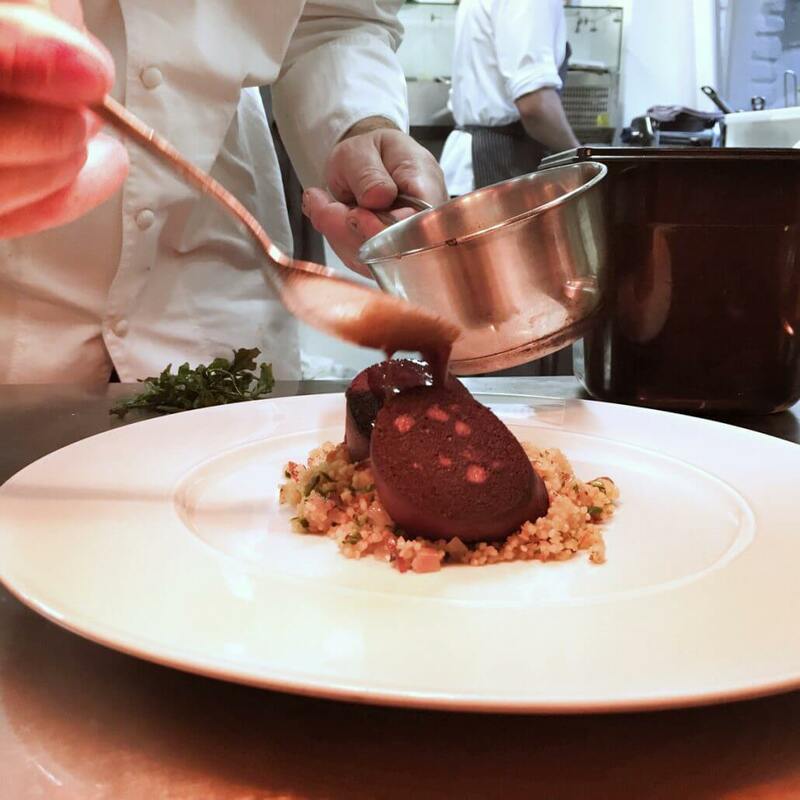 “We don’t use the term ‘signature dish’ here”, say Michelin star chefs Jan Maier and Tobi Becker from maiBeck – but I still get to try their famous “Flönz für Imis”. In fact, it is usually on the menu in winter anyway – winter being the typical “Flönz” season. The word “Imis” is the nickname given by those born and bred in Cologne to those who weren’t so privileged and moved here from somewhere else. 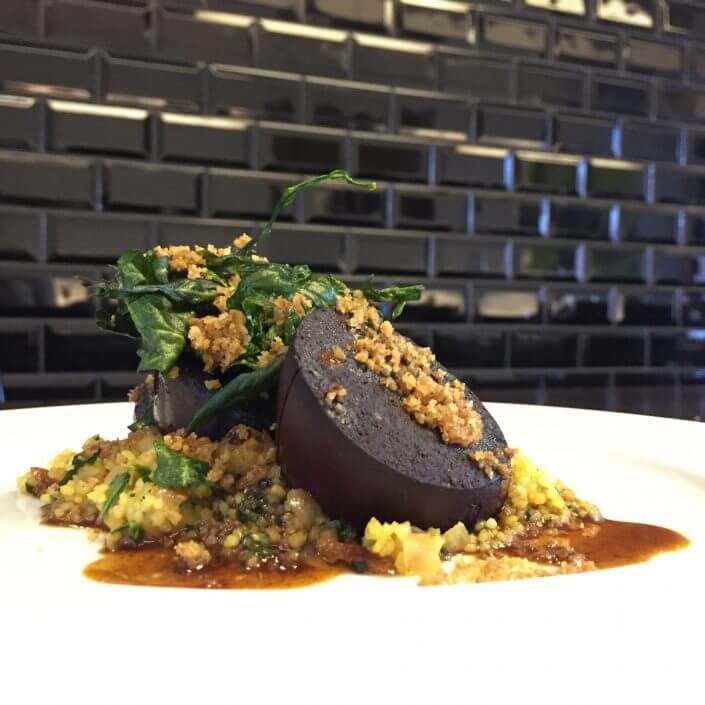 “Flönz” is local slang for “Blutwurst” or “blood sausage” (known to Brits as “black pudding”). It’s a word unique to Cologne, though the product itself is not. I’m served three slices of crispy fried Flönz, accompanied by couscous with mandarin peel and hazelnuts, Rauke and a flavoursome jus. In my mind, a must – even for those who always steer well clear of Blutwurst! 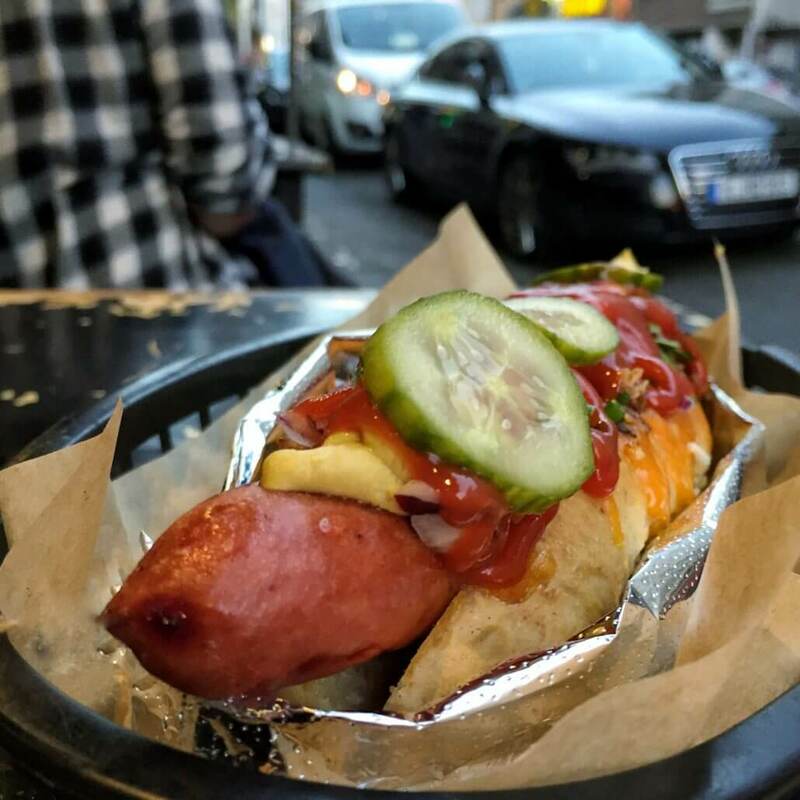 In the Ehrenfeld district, the culinary avant-garde are currently heading northwest, down Venloer Straße, which means you have to travel quite a bit to get to the new hotspots. As far as the Leyendecker Straße stop, to be precise. But the concentration of vegetarian and vegan eateries is much higher here than anywhere else in the city. 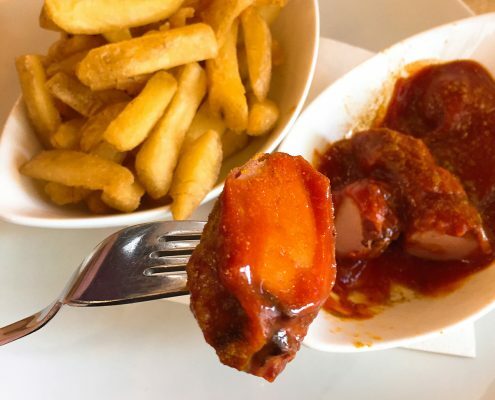 I tuck into a mouth-watering meal of vegan sausage, fries and the curry-inspired sauce that gives “Currywurst” its name.